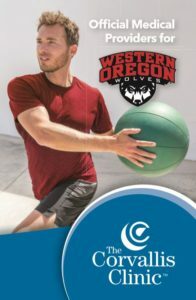 CORVALLIS — The Corvallis Clinic and Western Oregon University have announced that The Clinic is the new official provider of medical care for the university’s athletic department. Led by providers in its Orthopedic Surgery & Sports Medicine and Physical Therapy departments, The Clinic manages treatment of sports-related injuries and illnesses for WOU student-athletes competing in 13 NCAA Division II sports. The Clinic also provides pre-participation physical exams, facilitation of surgery, coordination of rehabilitation, and medical coverage at some athletic events. Matthew Taylor, M.D., a Sports Medicine Physician who completed a fellowship in Primary Care Sports Medicine and holds a Certificate of Added Qualification in Sports Medicine. Dr. Taylor is on The Clinic’s Concussion Care team. Angela Passanise, D.O., an Orthopedic Surgeon who completed a fellowship in Orthopedic Sports Medicine and Shoulder. Dr. Passanise’s surgical specialties include shoulder and knee arthroplasty. Richard Stanley, D.O., an Orthopedic Surgeon whose surgical specialties include arthroscopy of the shoulder, knee, and ankle. Paul Jaques, DPT, a Licensed Physical Therapist who is a Certified Strength and Conditioning Specialist and a Certified Orthopedic Clinical Specialist. Emily Antonishen, DPT, a Licensed Physical Therapist who provides vestibular rehabilitation therapy and is on The Clinic’s Concussion Care team. WOU has captured 36 regular-season Great Northwest Athletic Conference championships since its transition to NCAA Division II in 2000. In 2017-2018, the university ranked 48th in the Learfield Directors’ Cup Standings, its highest NCAA Division II finish in school history. The Learfield Directors’ Cup uses a scoring system as a measure of the highest performing athletic programs in the country.